This ice melter is environmentally formulated for safer removal of snow and ice. It contains CMA (Calcium Magnesium Acetate), an environmentally benign deicer. Where metal corrosion is a concern, PRO 2000’s special formula creates a bond between the surface area and the elements to protect. 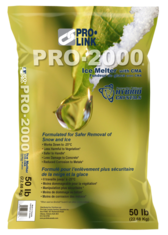 PRO•2000® combines the most effective deicing ingredients; creating the desired reaction to initiate deicing and meltdown. PRO•2000® when pre-applied prevents snow and ice from bonding to the surface area. As PRO•2000® goes to work, its time-released formula stays on the surface area longer, helping to control the freeze/thaw cycle. When properly dispensed, PRO•2000® minimizes tracking on floors and carpets. PRO•2000® goes after the ice and snow; clearing the way to safety. This specially formulated product contains “Dolomite” for added traction control; further enhancing performance. Nature’s own ingredients combine for just the right formula. Unlike some deicers, PRO•2000® works to preserve “vegetation and plant life” when used as directed. With PRO•2000®, there is no slimy residue being tracked in, making clean up virtually non-existent.